With every session, my goal is to capture authentic moments and interactions that showcase love and emotion; documenting what it felt like to be in that moment, right then. This is especially important to me when documenting mothers and expectant mothers, because I know from my own first-hand experience that the old saying, "the days are long but the years are short" couldn't be more true. These sweet moments with our darling little ones are fleeting. The world is so big and so busy that the tiny events that make our hearts flutter are often here and gone before we can remind ourselves to pause and take them in. It's those winsome snippets of time that I want to preserve forever. 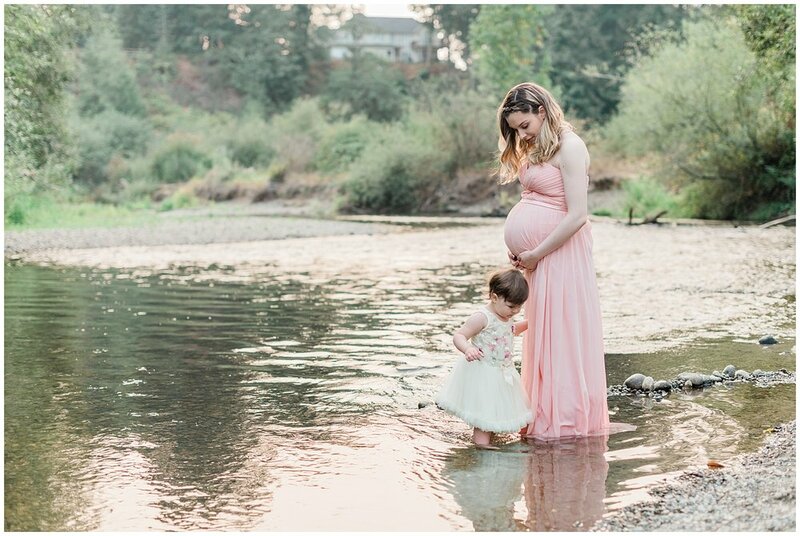 Moments like sweet little Serenity squealing with joy when her feet first touched the cold water of the river or the way she quietly paused, fascinated by the feeling of the sand trickling between her fingers as she snuggled on her mama's lap. This session was a special one for me because I knew Promise before she was a mother and even before she was a wife. In fact, it was about 15 years ago that we met, when her mom hired me to babysit her and her little sister. Promise was 7 or 8 years old then, and while we shared many joyful memories, the one that stays fresh in my mind wasn't exactly a highlight for either of us. We were playing together outside when I heard Promise scream. She hobbled toward me and it only took a minute before I noticed blood beginning to pool at her foot. She had stepped on a relatively large piece of glass. I had always been pretty weak-stomached and had even been known to faint at the sight of blood. But the moment I saw that Promise was hurt this crazy, unfamiliar instinct kicked in. I swooped her up and comforted her while simultaneously getting her and her little sister into the car to go to the doctor. Nothing mattered more to me in that moment than taking her pain away and letting her know that everything was going to be okay. I didn't know it then, but this was my introduction to motherhood. It was the first time in my life that I felt a 'maternal' instinct and yet it was many years before I would actually become a mom. What a beautiful gift it is all these years later to be able to share the joys, the sorrows, the challenges and perfectly imperfect realities of motherhood with you, Promise. I am honored you chose me to document this beautiful season for you and I cannot wait to meet your precious little boy!